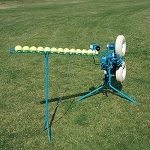 Anyone who has ever tried to outrace an auto ball feeder will tell you that they usually miss the first couple of pitches while they run back to the plate and get set up to hit. 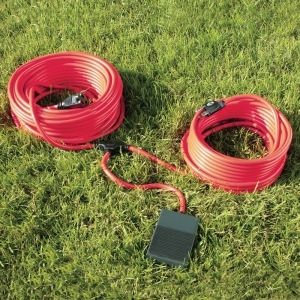 The JUGS In-Line On/Off Feeder Remote Switch turns auto feeders on or off with a click of the foot switch so that you don't have to race back to the hitting area after setting up your auto feeder to throw balls. 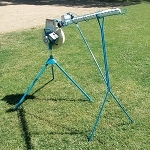 It is made specifically for JUGS auto ball feeders and will work with any of JUGS' auto feeders - baseball or softball. No matter where you order a JUGS Ball Feeder Remote Control from, NOBODY actually stocks them; they all ship directly from the manufacturer's warehouse located in Tualatin, Oregon. Therefore, the shipping time frame is exactly the same no matter what website you order from (we hope that it is this one!). JUGS Ball Feeder Remote Controls typically take 2-4 business days to ship from the time you place your order. They ship via United Parcel Service (UPS) and could take anywhere from a day or two to a week to get to you AFTER being shipped, depending on your proximity to their warehouse. We will notify you of your tracking number the moment we receive it from the manufacturer's warehouse. Expedited delivery may be available and you can certainly contact us to see what the cost would be for special one day or two day delivery. Be forewarned; it is extremely expensive and generally costs up to several hundred dollars more and still does not affect the processing time. In other words, it will still take the same time for the warehouse to process the order; it will just get to you faster once it is shipped!